Gary recommended the old plank cycle trail which was an old railway line to Juliet and which I took. It went for about 15 km and was lined by trees with rabbits and squirrels running out in front of me as I very quietly glided along. Later in the day, I took a little detour through Arora. Nice little town with a small island created by the river flowing over a couple of weirs and around. It was in the heat of the day……….up to over 25 degrees. Come the end of the day I found myself in Hinckley and sat on the side of the road, contemplating where I would camp for the night, when a guy pulled up and started talking to me. I told Tony I was looking to camp and straight away he said I could camp at his. 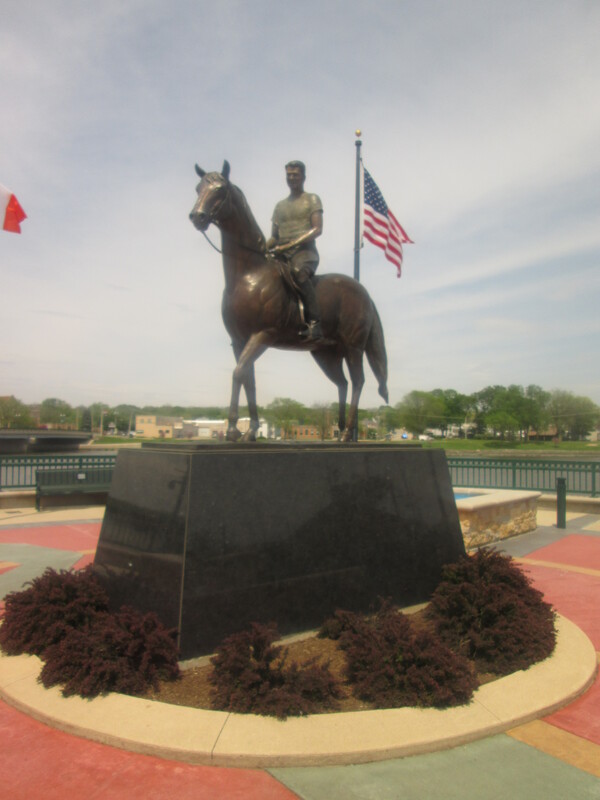 Around lunchtime I reached Dixon and discovered Ronald Reagan, former president of the United States used to live there. I crossed the river and stopped at McDonalds for the customary 2 hour lunch break to write the blog and check the internet. Just as I was cycling out of town I had a guy cycle up to me. 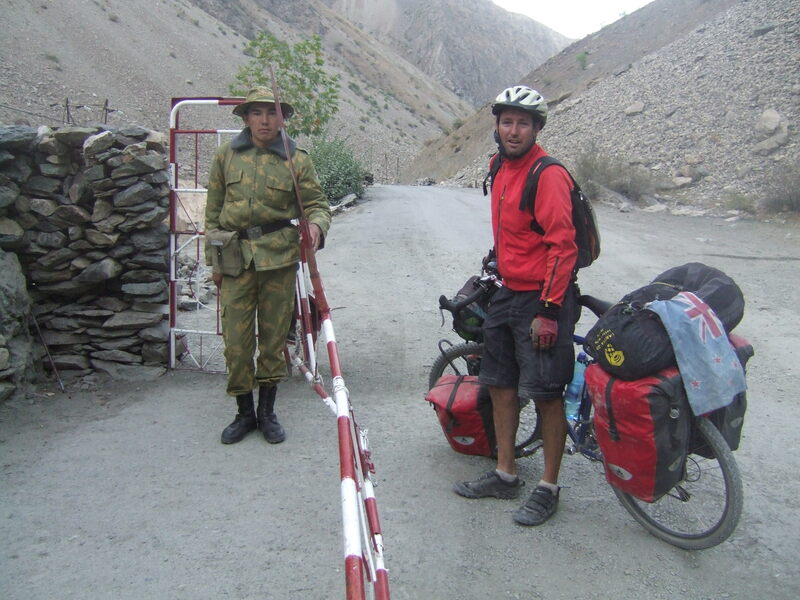 He was traveling light with just two small panniers on the front. I thought he was a local and was going to ask me if I needed a place to stay. Turned out Rich was cycling to Iowa for Mother’s day and was keen to ride with me for a little while. 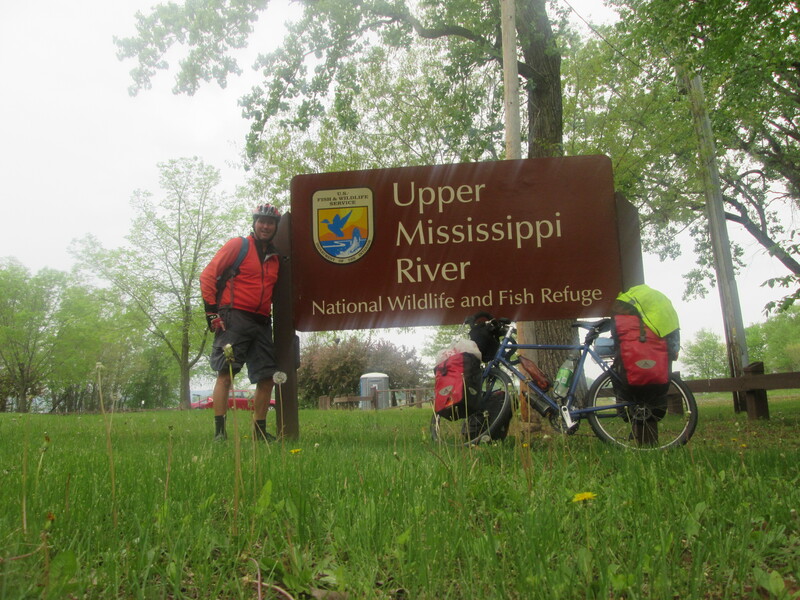 Rich talked me into getting off the main road and we went cross-country in the direction of the Mississippi. Cycling in tandem Rich certainly got me moving and we very quickly did 30 odd km to Milledgeville. We decided we would camp here for the night but first we stopped in at a local restaurant for Pizza. Rich offered to pay the first $20. The balance was $20.80 – so I certainly got the good end of that deal. We asked around and got some directions for a local park which is where we headed to camp for the night. It was a bit of a rush because a storm was coming and we just made it in time. We rigged it up so we could set up our tents under the picnic shelter which made things a bit more comfortable. The local police had a drive by and they seemed happy so they left us to it. There are a lot of trains going through Illinois. On average one every 20 minutes and they are 2 km long. There are 3 types: Double-decker containers from the West, timber from Canada and oil from North Dakota. They were coming all night and no matter what time it is they sound there horn constantly as they go through town. Rich was keen for an early start so we were up with the birds at 5 a.m. I just cycled two hours with Rich to Thomson, which is on the East bank of the Mississippi. I am going to follow it north for a few days all the way to Minneapolis whilst Rich went South. I went straight in to the Cafe. 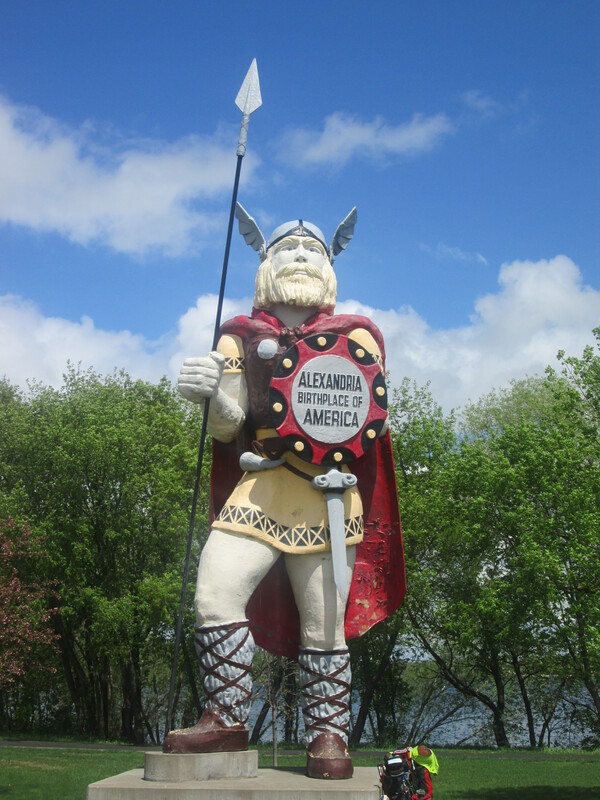 The locals were super friendly and I very quickly had breakfast bought for me and afterwards was taken on a quick driving tour by Lawrence the local historian to see the causeway and the widest part of the Upper Mississippi. On the way we passed a massive prison that was built to hold the Guantamo Bay prisoners but has now been turned into a federal prison. The rest of the morning I cycled partly on the river trail which is an old railway line built through swamps with lots of birds around. Saw a small bird that was completely red and had a bit of a crown. No idea what it was but wonder if it could be rare or as common as a sparrow. 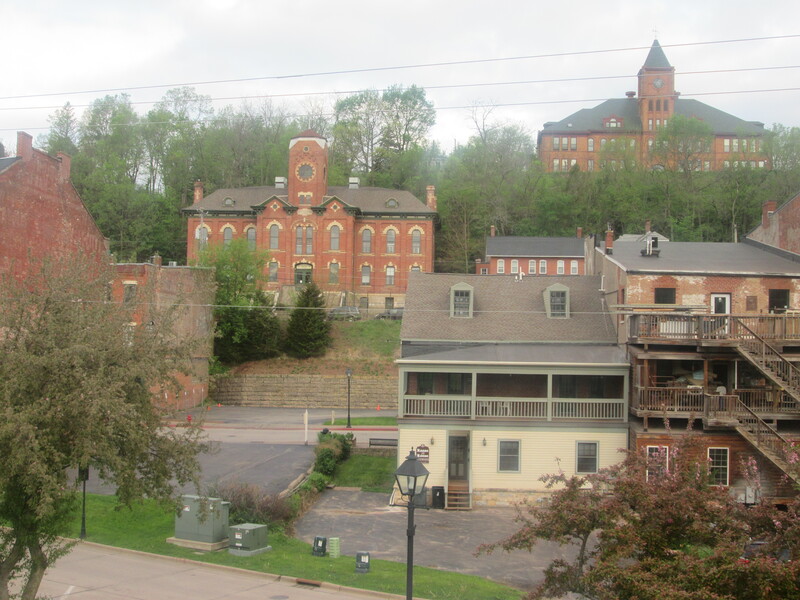 Galena is a very nice town. On the way in I stopped to look at General Grant’s house (former president and civil war general). 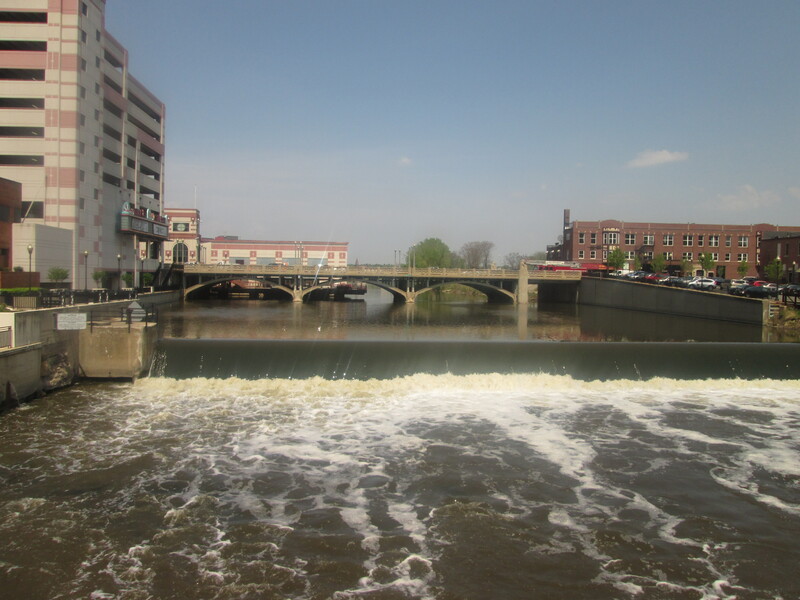 There is a river that runs down the middle of town. I stopped in Grant Park and cooked my dinner for the first time in a long, long time. Pasta, olives and half a roll of salami I have been carrying around for a month. It tasted really good. I am just writing the blog as the sun goes down on another day. 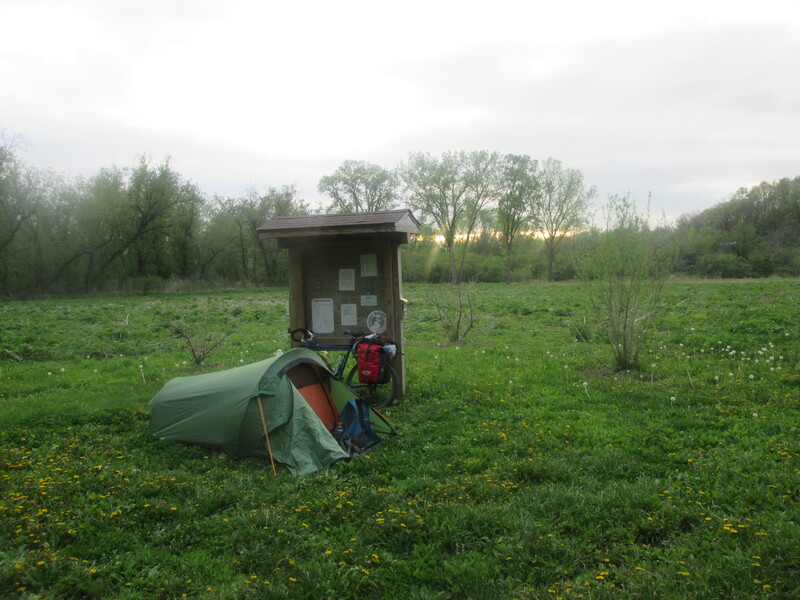 I will shortly cycle a little way along the river to find somewhere to camp for the night. Being a Friday night there could be a few people around. I had a really nice night camped in a field about 1 km from town. I had some deer come past in the night and I could hear thousands of frogs croaking in a nearby pond. But wasn’t enough to stop me sleeping. The stars were out. 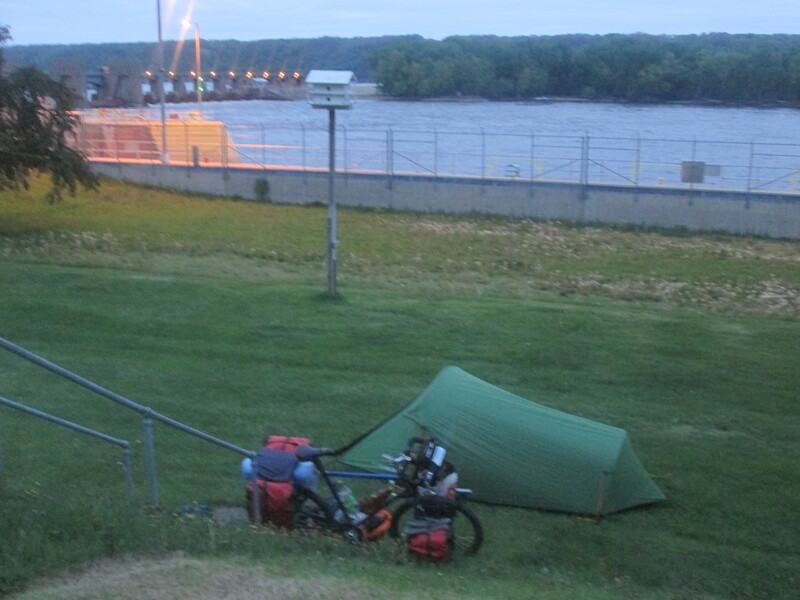 I cycled for an hour out of Galena till I reached Dubuque on the other side of the Mississippi. 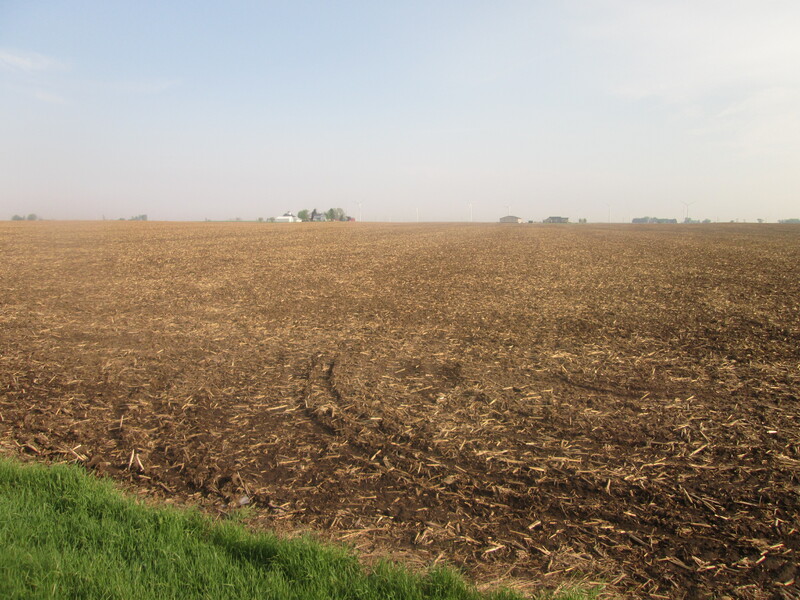 I am now cycling in Iowa. The people here are pretty friendly. In McDonalds I had a few people come up and say hello. One elderly couple said they had seen me cycling yesterday. When they left McDonalds they had seen the bike and came straight back in to find me. I left Dubuque on an old rail trail and then took the Great River road which went up and along a ridge on top of the Bluffs for miles and miles. It was awesome views of the countryside and occasionally the river. I got to Guttenburg around 5 p.m. A nice old river town. There is a lock here for the big barges going up river. I checked out the main street and have found a nice place for me to camp later tonight. 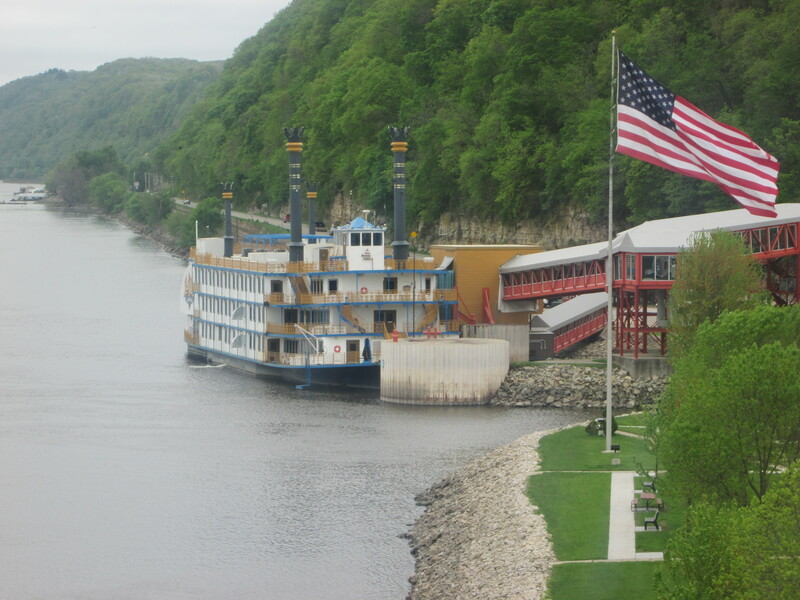 It is just behind the tourist office and the Mississippi. I couldn’t be bothered cooking so I went into the local bar for a meal. Super friendly locals. Everyone was offering to buy me a drink………..I politely declined because I’m sticking to the water to rehydrate. I got talking to Gerry, Manager of the local golf club and ex-Navy jumper. He kindly paid for my meal. Another couple came in who were avid cyclists and asked if I wanted a shower. After their dinner they took me back to their step-mums for a shower and I succumbed to a beer. Everyone has been so friendly and kind. Under the cover of darkness I found my camping spot. You would think following the river it would be flat. Not on this side of the river. I was straight into the hills as soon as I left Guttenburg. I had two good hills before reaching Mc Gregor another old river town. It was a cold morning and I was cold having sweated going up the hills. It is difficult to get the layering right. 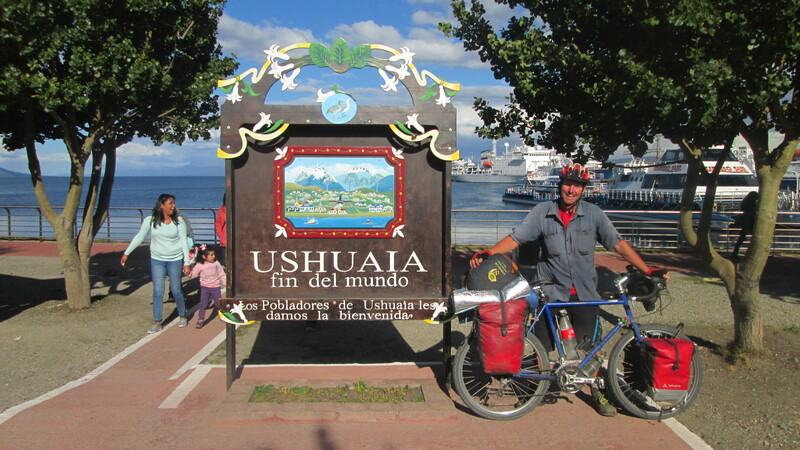 I dived in to the local coffee shop and got talking to Jerome, a cyclist and Jan his wife. They very kindly bought me an Egg, Bacon and Hash Brown breakfast which was a step up from the cup of muesli, banana and yoghurt I had before leaving Guttenburg. Following some good advice from Jerome I cycled a few miles up to Marquette with its casino river boat and took the bridge over the Mississippi to Wisconsin. Good decision. Nice and flat and the road follows the river much more closely. There is an abundance of wildlife beside the Mississippi river and today I saw my first Bald Eagle – easy to spot with its white head and white tail. There is a storm and tornado warning for this evening. Could be in for an interesting night. When I saw the small picnic area of the town of Buffalo, I was sold. It was only 4:30 p.m. but I was bitterly cold. I was so happy to be able to put on some dry warm clothes. The next thing was to fire up the stove for a hot cup of tea and then a pot of hot pasta with salami and olives. Then it was tent up and straight into bed to listen to the radio for a while. It has really turned cold. I had to battle it out this morning slowly grinding into a bitterly cold headwind accompanied by annoying rain. I was cycling past lots of nice lakes which I thought would be really nice in summer. But at this present moment I didn’t care too much for them and I just kept my head down facing the ground. When I reached Alam I dived into the first cafe I saw to get out of the cold and warm up. I ordered a breakfast and at the end, the waitress Heather came out and told me the owner was paying for me after she learnt what I was doing. There is definitely a nice pattern developing. 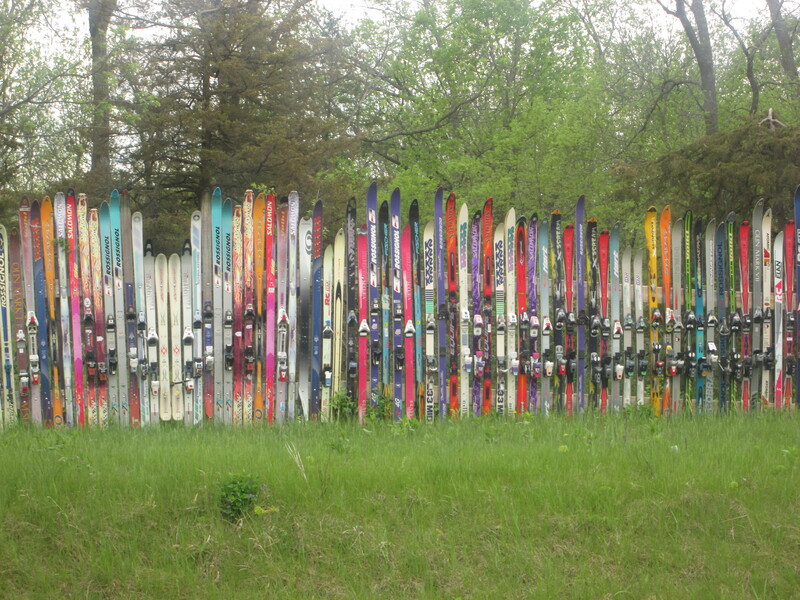 This was an interesting collection of skis fixed to the fence. I was happy in the afternoon when the rain cleared and the sun came out…………but it was still cold. I ended the day camping in a roadside rest area which clearly stated no camping. I have to try my luck. However, I got a fright when a car pulled in followed by a police car with flashing lights. I was about 100 metres away and just putting up my tent. I kept going as normal and then sat at the picnic table deciding if I was going to get in my tent and hide. I just got my journal out and worked on that and eventually the police left without me gaining eye contact. 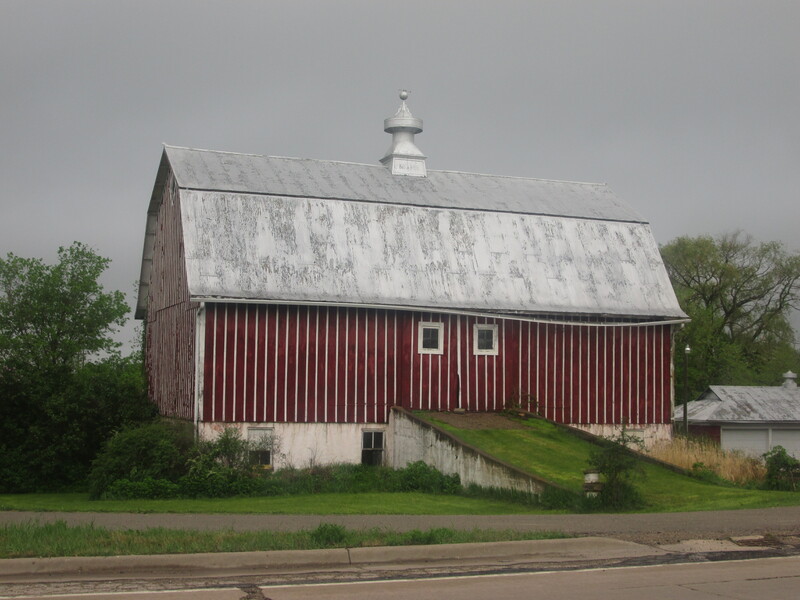 On the Wisconsin side of the Mississippi there are small towns about every 13 km. I passed through: Bay City……….a little misleading because there is nothing there. 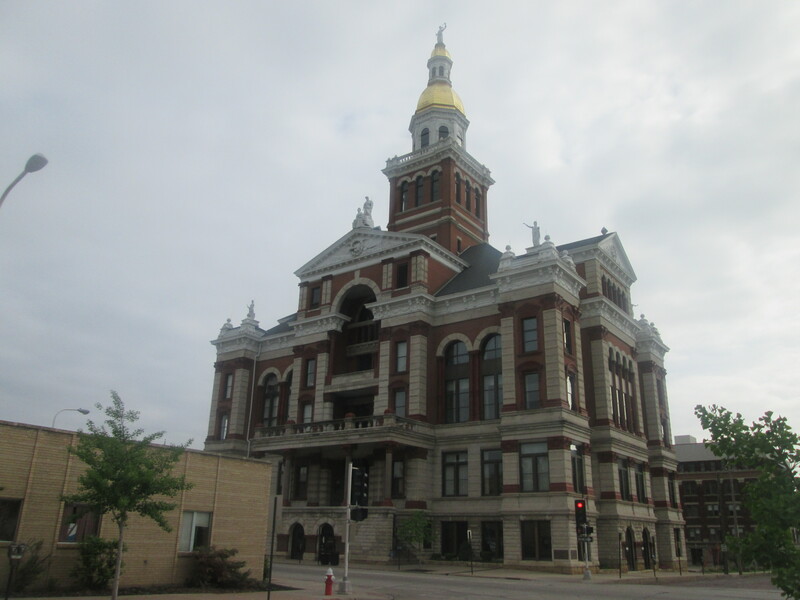 Hager City………same and Diamond Bluff also before stopping for lunch in Prescott. By this time the sun had come out and it was actually a really nice day. At Prescott I crossed over the Mississippi into Minnesota. I was able to jump on a good cycle path to take me up to St Paul (the other twin city). Along the way, in a city of 400 000 I ran into a guy called David who was riding an Incombant. Small world! 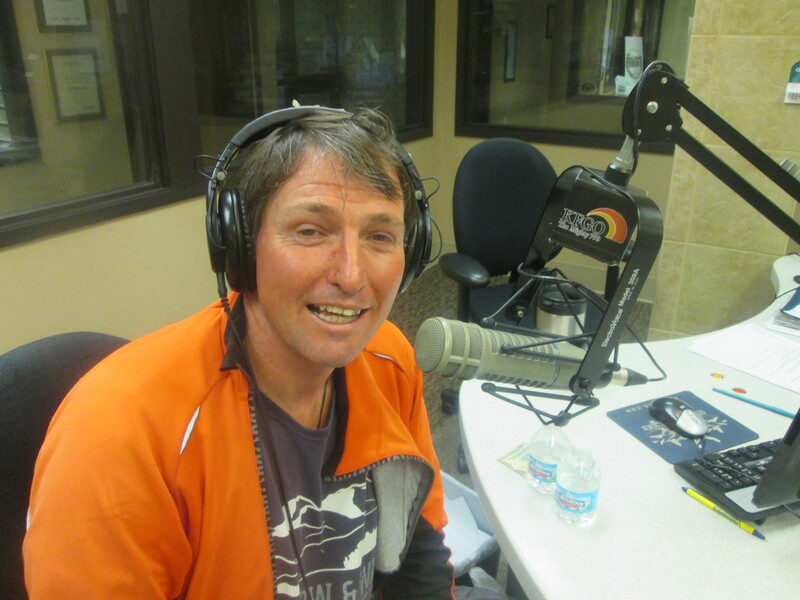 He asked if I was staying with Chris Olson………..who coincidently is my “Warm Showers” host for the next two nights. David kindly gave me a city cycling map and planned a sight-seeing route for the 30 km cycle across the city to Chris’. Minneapolis is an awesome city for cycling. Currently ranked 2nd in the US for its trails. 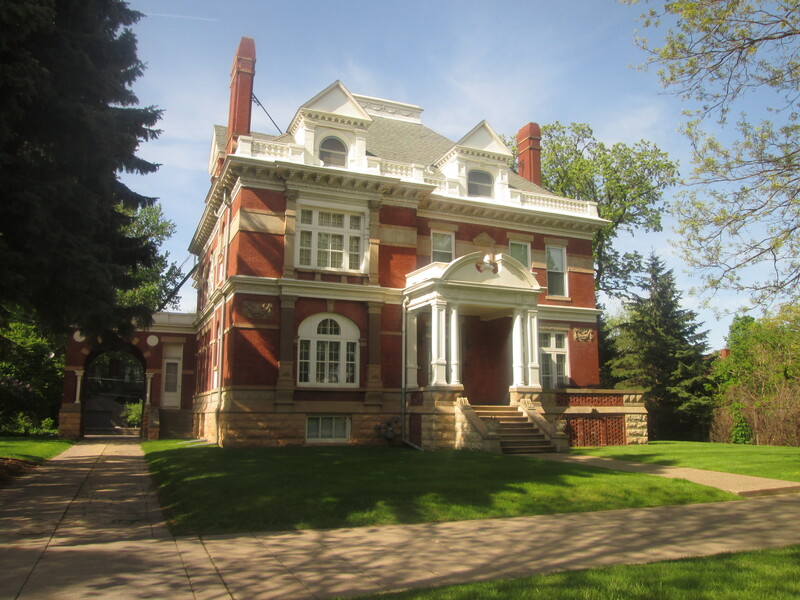 My route took me through St Paul down Summit Avenue past all the massive Victorian Mansions and over the river to Minneapolis to pick up the Mid-Town greenway trail which is an old railway line that has created a corridor to allow cyclists to cross the city pretty much car free. It was been well used. Loads of cyclists about. Everyone has been so friendly. I was stopping to talk to loads of nice people. Some even asked if I had a place to stay and if not they would have invited me to stay. This happened on more than one occasion. It is such a green city with so many trees, parks and open spaces. 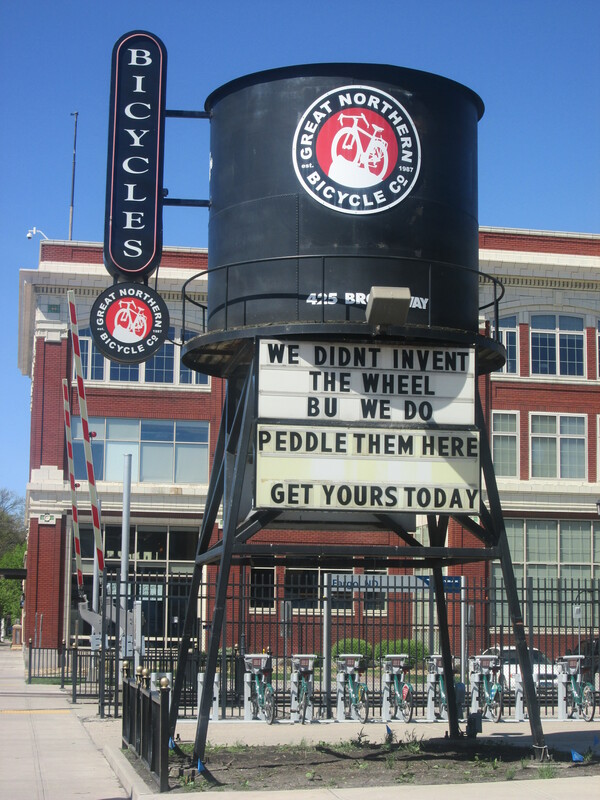 It is ride-a-bike week in Minneapolis and I was lucky enough to come across a bike station. Stopped and chatted to the crew and they kindly gave me some muesli bars. Next on the tour was Calhoun and Harriet Lake. 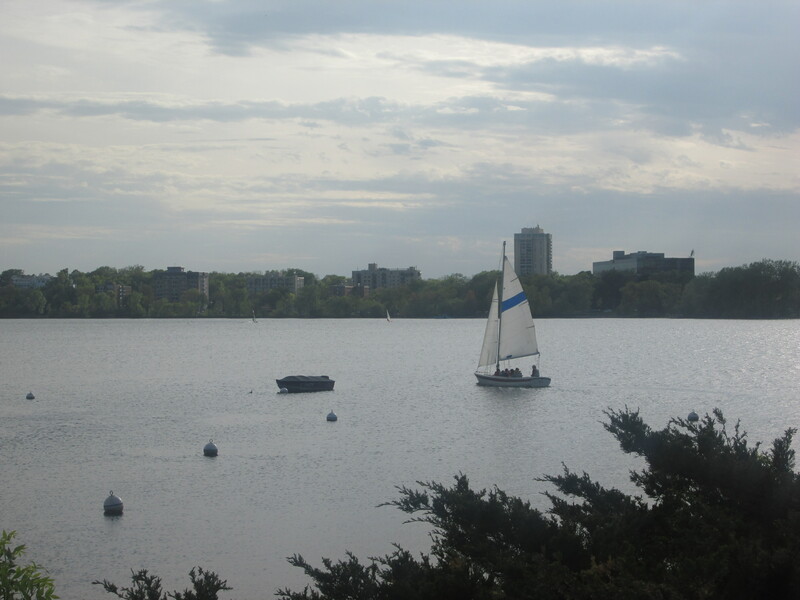 People were out sailing, drinking and socialising. 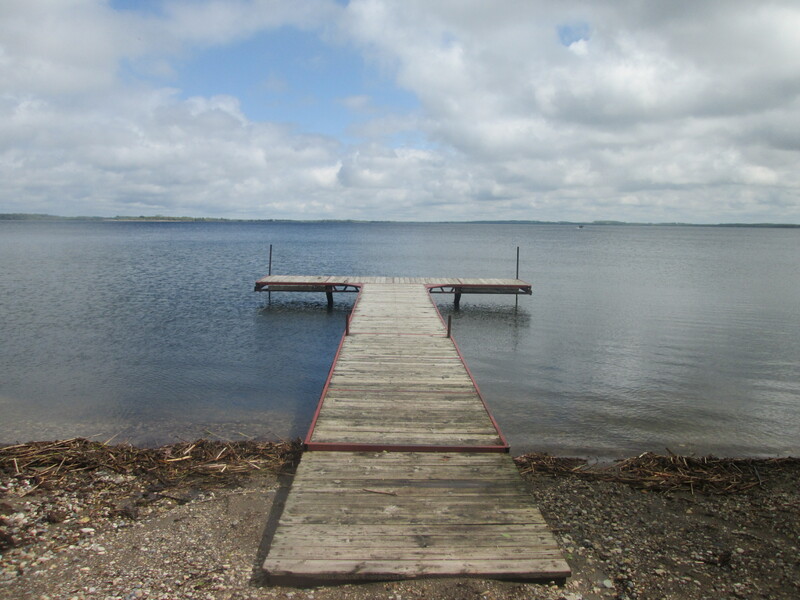 The lakes are a real gem for Minneapolis. I reached Chris’ house at 7:30 p.m. First thing was to clean myself up. Feeling pretty grotty not shaving for a week and not showering for at least 4 days…………..The best I do is a wipe down with some baby wipes. Chris, a fellow cycle tourist with many trips in the States and Asia invited some friends over and we had a fire in his backyard. We drank some beer and had some pizza. I enjoyed telling a few stories and hearing a few as well. It was midnight before we called it quits. Surly the company that makes my bicycle is based here in Minneapolis. I have been in contact with them since last year. 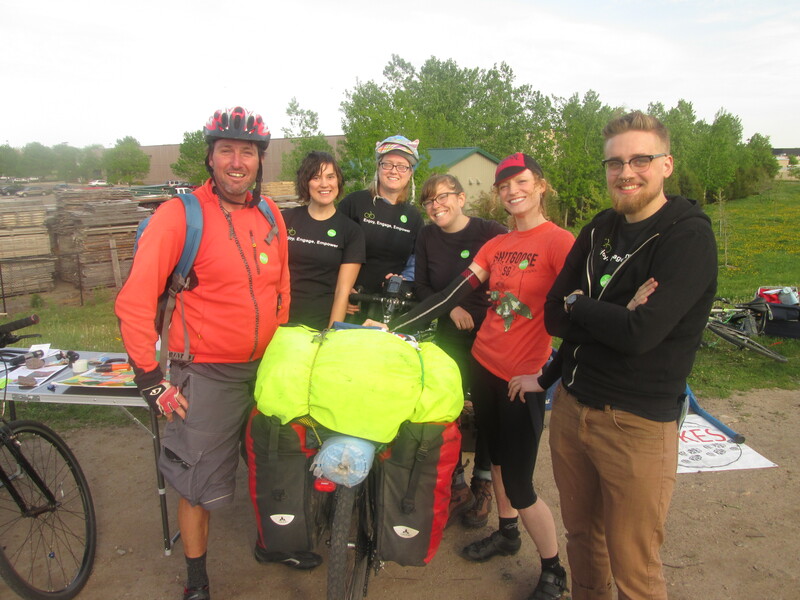 I told them last week I would be passing through and I was going to go on a Surly ride with a few of the guys and which was going to end with a few beers and a BBQ. 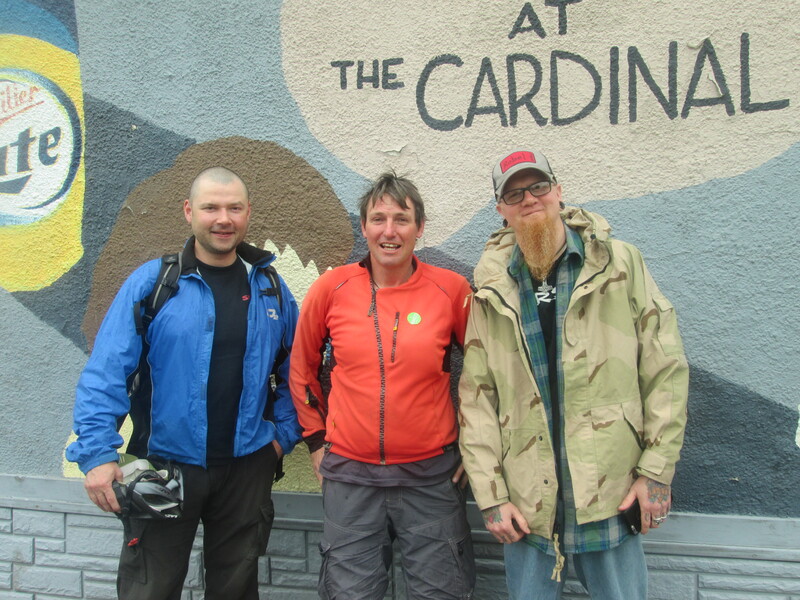 Unfortunately it was cancelled because of the rain but I did manage to catch up for breakfast with two of the guys from Surly. We had a good chat. Bob and John are really nice guys. I had asked for some new stickers for the bike and I got a whole lot more – T shirt, socks and a few other bits and pieces. Chris cooked us a good breakfast of French toast and bacon. Nice way to start a cycling day. The day started cloudy………..at least no rain. 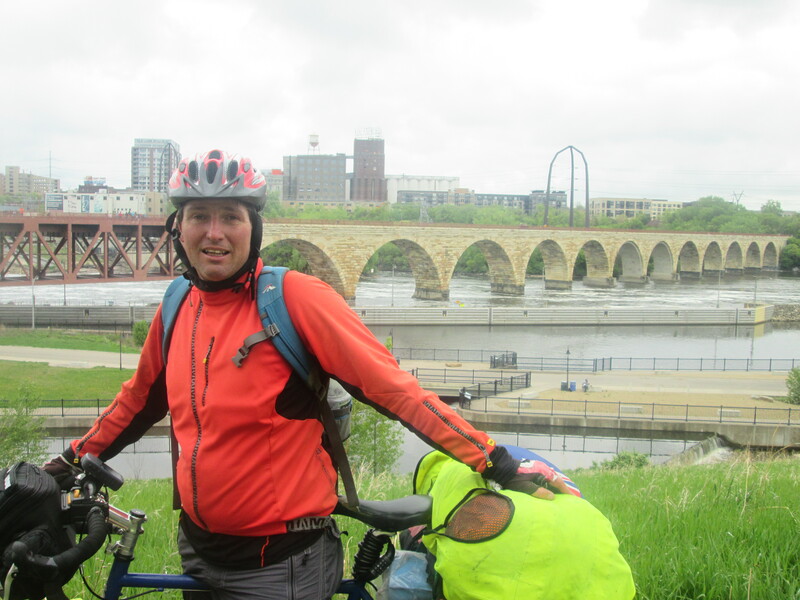 Chris cycled .I should say guided us for the first 25km through the city and out on to the MRT (Mississippi River Trail). Along the way we called at the bank…………thought it was about time I checked my ATM card worked okay. I’m glad to say it did. Went to the bike shop for a puncture repair kit as I had had the old one out yesterday to repair a puncture and the glue had gone hard. More chain oil as well. Seem to be using a lot. We skirted on trails around the outskirts of downtown and along the river. The ruins of the old mill still remain and the old arched stone bridge stood out. I enjoyed cycling on the MRT which ran directly beside the river or through woodlands. Late in the day I was cycling through a park when I say a couple on the trail. Just as I was passing I said Hello. It scared the living daylights out of the woman. I stopped and talked and they invited me back for dinner and then to stay. Gerrie and Dave are now retired. They were great hosts and we had a really nice evening. Gerrie kindly made me up a package to go with containing cooked sausages, salami, ham and berries. The MRT trail finished in Anaka so I jumped on HW10 for about 70 km to St Cloud. Turning off here I have hooked up with a 260 km cycle trail (old railway) which will get me most of the way to Fargo. I got on the trail about 2:30 p.m. It is nice and flat and pulls away from the main road so for good periods you are right out in the countryside. Lakes on one side and fields or woodlands on the other. When the trail reaches a town it goes right through these little towns just like the old railway did years ago. I got to a point where I was pretty tired and only 1 km from Sauk Centre. 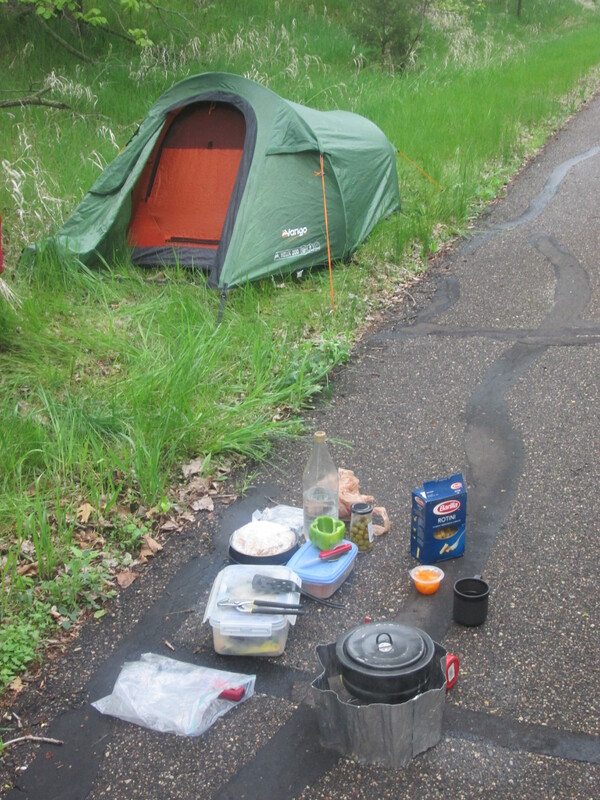 I didn’t want to enter this evening so I stopped and put up my tent on a small strip of grass next to the trail. While cooking my dinner I could hear the thunder close by. Just as I was finished cooking my dinner the rain came. As I listened to my radio in my tent, they kept interrupting the normal programme to issue a weather warning of possible tornados. It is a bit disconcerting when they mention that if the house starts to shake get in your basement or in the bath. In my tent I have nowhere to go. The weather has turned really nasty. I managed to cycle a few km up the road without getting too wet. I then had to sit it out in McDonalds for two and a half hours while it absolutely tipped down. I was frustrated as I was losing valuable cycling time. At 10 a.m. I got back on the rail trail again and tried to make up for lost time. The sun came out for a few hours…………then at about 2 p.m. the sky opened up again and I sought refuge in a very local pub. Everyone was lined up at the bar and they were a bit stand offish at first. But they slowly warmed to me and I accepted an offer to stay with some locals for the night. I thought was a good idea because I have been wet and cold for the past few days. 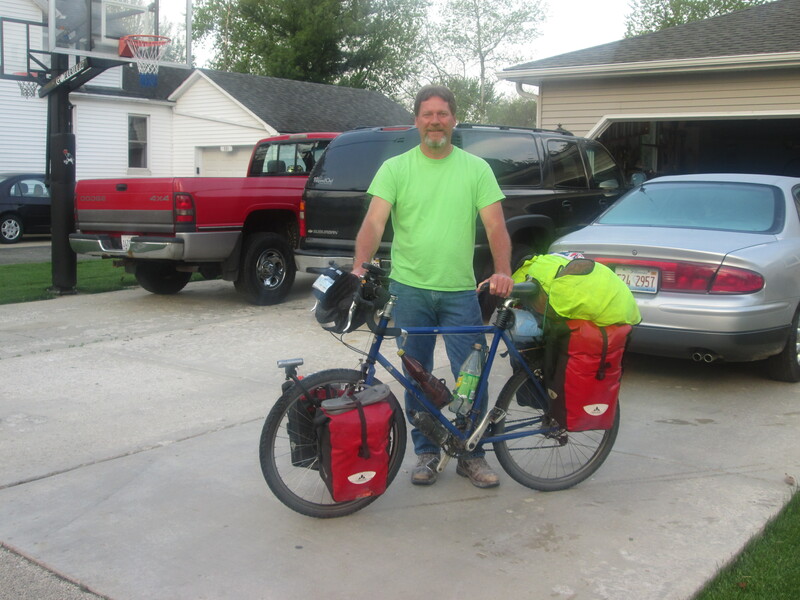 But the storm ended up passing at about 4 p.m. so I decided I would continue cycling for a few more hours as I really want to make Fargo North Dakota tomorrow. I did manage to get another 30 km down the road before the rain returned. I made it to Dalton in the nick of time. I was able to set up camp under a picnic shelter. The temperature was now down below zero. I cooked up a hot dinner before going to bed. It was impossible to sleep. The wind and the rain was so strong. My tent was getting battered. I was waiting for my tent to shred itself. I could hear the big gusts of wind coming. It was a bit frightening. Today was a no photo day. I say that because things were so uncomfortable that there was no way I was going to take even the slight amount of time to get my camera out or let alone stop. It was bitterly, bitterly cold. 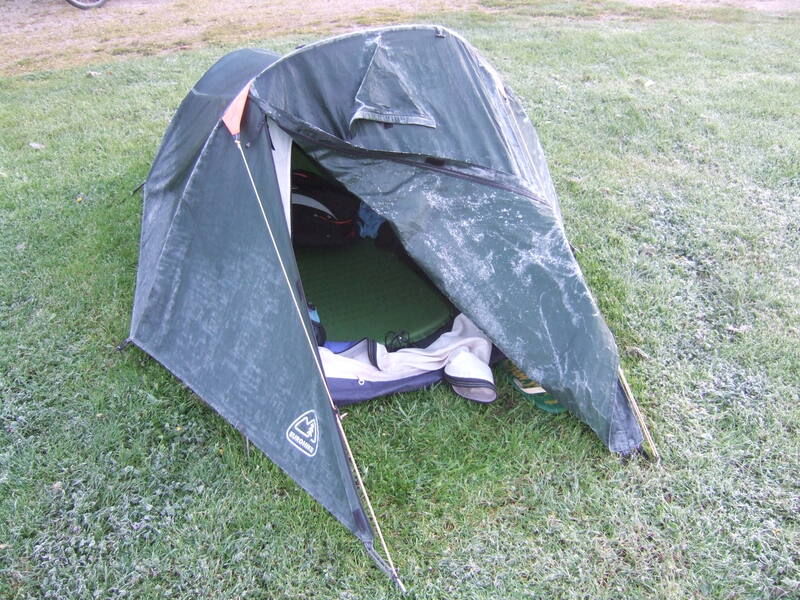 It was difficult and painful to pack up the tent. I cycled straight into an unabating horrendous headwind. 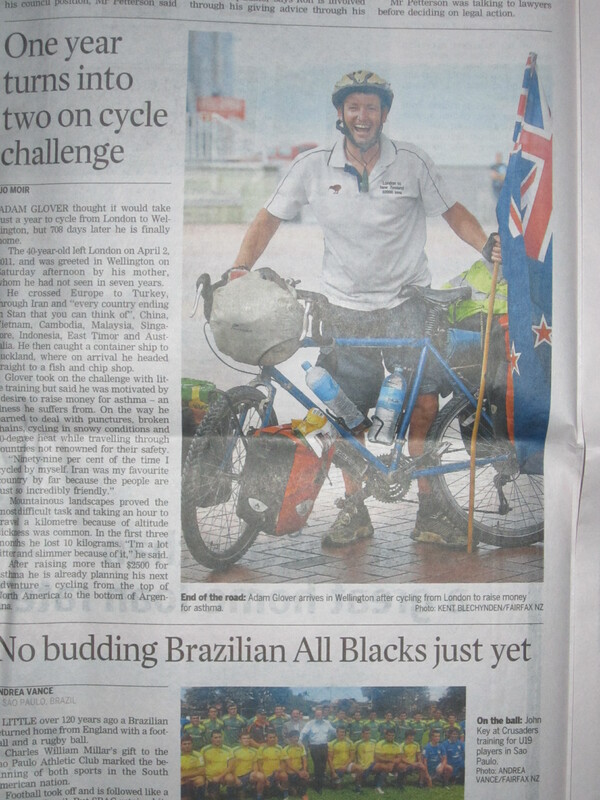 I was moving at only 5 to 10 km an hour………..mostly 5 km an hour with head down and a slight drizzle. I was cycling past really nice lakes. At the present not enjoying or appreciating their beauty at all. After an hour and a half I reached Fergus Falls and called into a coffee shop to warm up. I was determined to reach Fargo this evening and at 10 a.m. I ventured back out into the elements. In 3 hours I barely did 20 km. Slowly grinding into a demoralising headwind with driving sleet. Another problem was the road which was just so open and exposed. There was no hiding from it. When I reached a small truck stop, I was so wet and cold. I had to go in to warm up. I had some soup and hot honey and water and changed my clothes as well. After an hour I got back in it and with such slow progress was resigned to the fact I wasn’t going to reach Fargo. I was gutted as I wasn’t going to be getting a hot shower. Feeling quite demoralised I continued slowly for another two hours till I reached Barnsville. I called into the local police station and was told I was still 50 km away from Fargo. Since it was late in the day I couldn’t risk going on with the temperature below zero. The police gave me directions to the community campground. So I set up there and prepared for the bitterly cold night ahead. What a difference a day makes. The wind has gone and the sun has come out. 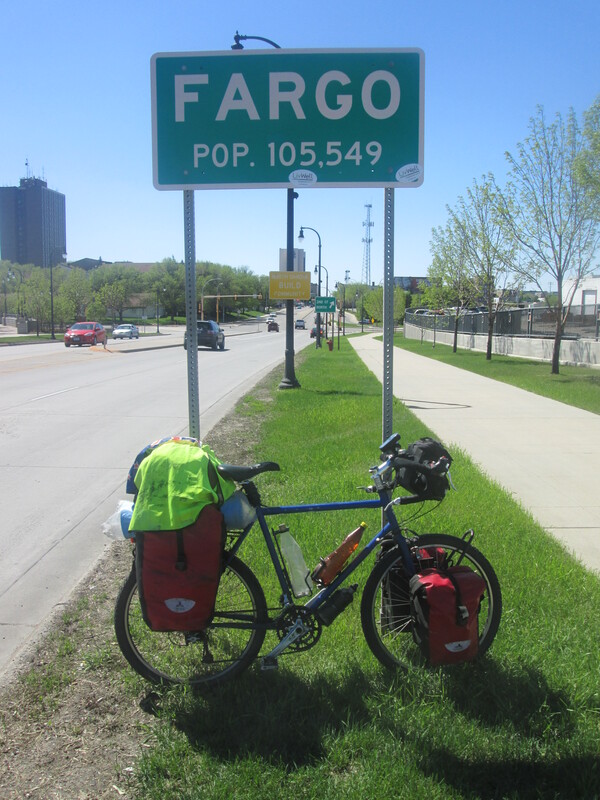 A much more pleasurable day to cycle in to Fargo North Dakota. I was in Fargo shortly after lunch and spent the afternoon having a good look around before cycling down to my “Warm Showers” host Dan’s apartment. Yesterday I met a guy in town who said he had a friend at a local radio station who would be interested in interviewing me. 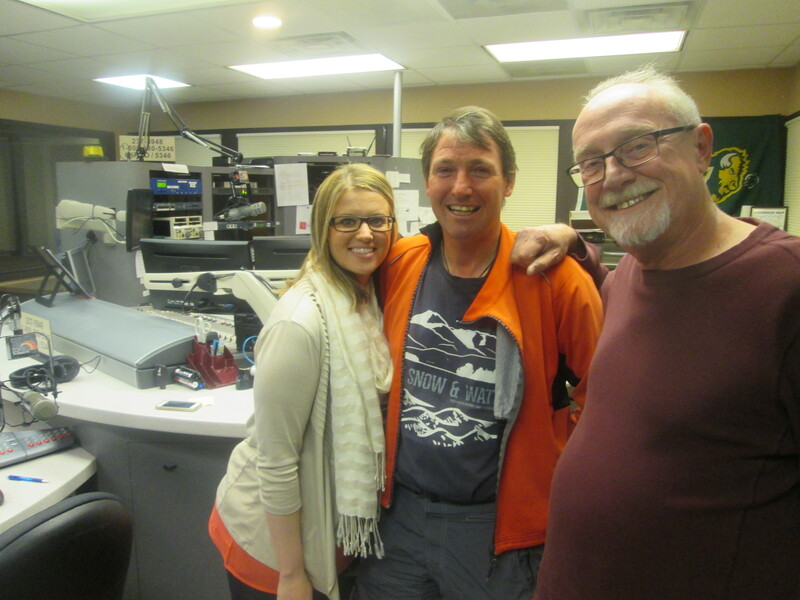 So this morning I found myself in the studio at KFGO Fargo to do a live interview with Amy and Jack. I had plenty of butterflies. I am happy to say it went really well. After my interview I went back to McDonalds and was listening to the show. A few hours later I heard Jack and Amy discussing my interview. 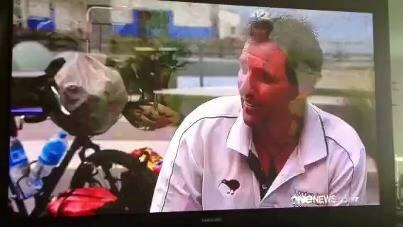 Then during the 2 p.m. news bulletin my story featured as one of the items. It was so surreal to be sitting in McDonalds listening to the radio and they were talking about you.